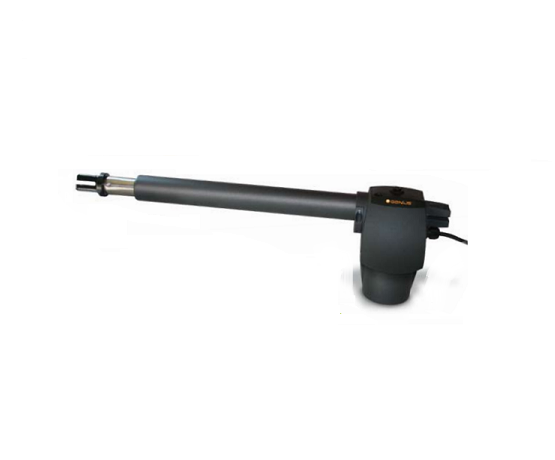 G-BAT is sturdy mechanism with bronze crown and steel screw and guarantees long life to the motor. The axial thrust allows opening of gate leafs up to 4 metres. It comes with a 24V ENV with a virtual encoder. Top ranking for innovation – G-Bat, the updated version of the Euro Bat, provides state-of-the-art technology, top performance and safe efficiency. For G-Bat we selected only the best components, guaranteeing a long-running, flawless performance. Winning reliability – The sturdy inner kinematic mechanism which comprises a bronze crown/steel worm screw, guarantees a long life and, therefore, a high number of openings/cycles. Protection class IP54. Its strength lies in its simplicity – Available both with right- and left-hand opening; this allows an installation as close to the hinge as possible without the need for building work. The axial thrust enables greater power and allows opening of gate leafs up to 4m. The automatic release is easy to find and activate. Top versatility – This product is available in 230V and 24V versions with a 24V ENV with virtual encoder. The 24V versions can be equipped with a backup battery (optional) which allows the gate to be opened in case of power failure. Careful attention to design – The automation’s dynamic and elegant style follows the evolution of modern design.